Mack Trucks introduced its new, next-generation highway hero, the Mack Anthem™, during the Mack Global Dealer Summit in Allentown, Pennsylvania. The Mack Anthem is a re-engineered, redesigned and reimagined interpretation of what today′s highway truck should be – aerodynamic, comfortable and connected, all with a distinctively bold Mack look. ALLENTOWN, PA (Sept. 13, 2017) – Mack Trucks today introduced its new, next-generation highway hero, the Mack Anthem™, during the Mack Global Dealer Summit in Allentown, Pennsylvania. The Mack Anthem is a re-engineered, redesigned and reimagined interpretation of what today's highway truck should be – aerodynamic, comfortable and connected, all with a distinctively bold Mack look. "As one of the most significant new trucks in Mack's 117-year history, the Anthem combines our latest innovations with more than a century of truck-building know-how," said Dennis Slagle, president, Mack Trucks. "The incredible result is a truck that's been built for our customers' business and designed for drivers, all while delivering the power and presence that only a Mack truck can deliver." "Every detail on the Anthem was designed with purpose," said Jonathan Randall, senior vice president, sales, Mack Trucks North America. "We surveyed thousands of drivers and incorporated their feedback to deliver a functional, strong, efficient highway truck with an authentic design unlike anything on the road today." With its chiseled, muscular looks, the Mack Anthem makes a clear statement. Yet despite its chiseled appearance, the Mack Anthem's new aerodynamic enhancements improve fuel efficiency by up to 3 percent. In addition to a new hood and grille, Mack engineers redesigned the roof and chassis fairings, mirror covers, and front bumper and air dam to more easily cut through the wind. "Looking at the new Anthem for the first time, most people are struck by its strong, distinctively Mack design," said John Walsh, Mack vice president of global marketing and brand management. "But it's also incredibly aerodynamic. Using advanced computer modeling together with coast-down testing at Kennedy Space Center, our designers and engineers developed an extremely efficient design that cuts drag and saves fuel, helping boost customers' bottom lines." The Anthem's redesigned hood and bumper not only improve aerodynamics, they also help cut service time. Both feature three-piece construction for improved serviceability in the event of damage. A new hood latch and release system also saves drivers' time during pre-trip inspections. A central latch release below the grille eliminates the need for drivers to walk from side to side to tilt the hood. The hood also requires 50 percent less effort to raise than before. All exterior lighting on the Anthem is now exclusively LED, meaning brighter, longer-lasting lights that draw less energy. The change to LED is most noticeable on the Anthem's headlights, which are 66 percent brighter than today's bulb. The new LED headlights improve nighttime safety by casting a wider beam down the road and producing a whiter light to better illuminate objects. The Mack Anthem features an all-new driving environment that incorporates driver feedback for improved functionality, ergonomics and convenience. Gauges on the instrument panel have been positioned higher for better driver visibility, while HVAC controls and the Mack mDRIVE™ automated manual transmission (AMT) shift pad have been relocated closer to the driver's fingertips. All switches for additional truck functions like cruise control, PTOs and traction control now feature laser etching to help maintain markings over the long life of the vehicle. Behind the steering wheel, Mack's Co-Pilot™ display has been updated with a new 5-inch, full-color screen for improved visibility and more intuitive navigation. Co-Pilot provides drivers with a convenient way to monitor vehicle information, including engine and oil temperatures, trip odometers, after treatment status, tire pressures and more. A Pre-Trip Assistant guides drivers through inspection points and includes a single person exterior light inspection mode. "The goal of our design team was to incorporate as much driver input as possible, adding features they identified as necessary to improve productivity and comfort," said Stu Russoli, Mack highway product manager. "Just one look at the Anthem's new instrument panel and it's clear they succeeded in developing intuitive, easy-to-use and durable controls that meet the needs of all drivers." The Mack design team's attention to detail is also reflected in the Anthem's sleeper, resulting in a spacious, comfortable environment for drivers. The all-new 70-inch sleeper now features stand-up height for even tall drivers to easily walk-through the cab into the living environment. The interior volume of the new sleeper is 35 percent larger than previous models. Anthem's 70-inch Stand-Up Sleeper models are available in single or double bunk configuration. Mack's legendary integrated powertrain gives the Anthem the performance drivers need to accomplish any over-the-road task. Proven, efficient power from Mack's 2017 MP® series engines combines with industry-leading Mack mDRIVE™ automated manual transmissions and Mack axles to deliver power and efficiency without compromises. Mack's SuperEconodyne downspeeding packages are available with both Mack MP7 and MP8 engines. Thanks to the complete integration of Mack's engines with the mDRIVE AMT, SuperEconodyne enables a lower cruise rpm to help save fuel. Available exclusively with SuperEconodyne is the Mack MP8-TC engine. Featuring turbo compounding, the Mack MP8-TC captures and converts waste energy from the exhaust into mechanical energy that is fed back to the engine. The turbo compounding system feeds up to 50 additional horsepower back to the crankshaft, enabling additional performance while improving fuel efficiency. Combined with the Anthem's aerodynamic improvements, the Mack MP8-TC engines provide up to an 11.8 percent improvement in fuel efficiency compared with a baseline from previous Mack models equipped with GHG2014 engines. "The MP8-TC is ideal for customers whose applications involve long, steady-state cruising on routes with terrain ranging from flat to rolling hills," said Scott Barraclough, Mack technology product manager. "The turbo compound unit allows the MP8-TC to deliver full torque as low as 900 rpm, allowing for fewer downshifts and improved efficiency." Mack's 12-speed mDRIVE AMT is standard on all Anthem models. Fully integrated with Mack MP engines, the mDRIVE uses sensors to detect speed, load, grade and more to ensure the right gear and shift points are selected for conditions. The mDRIVE also eliminates traditional shifting, helping reduce driver fatigue and allowing the driver to remain focused on the road. It also helps with driver recruitment and retention because of its ease of use. Mack's reinforced and ruggedized mDRIVE HD AMTs are available as an option on all Anthem models. With stronger, more robust internal components, the mDRIVE HD is designed to handle the more frequent shifts that heavy loads can bring. Mack also introduced Mack Connect. 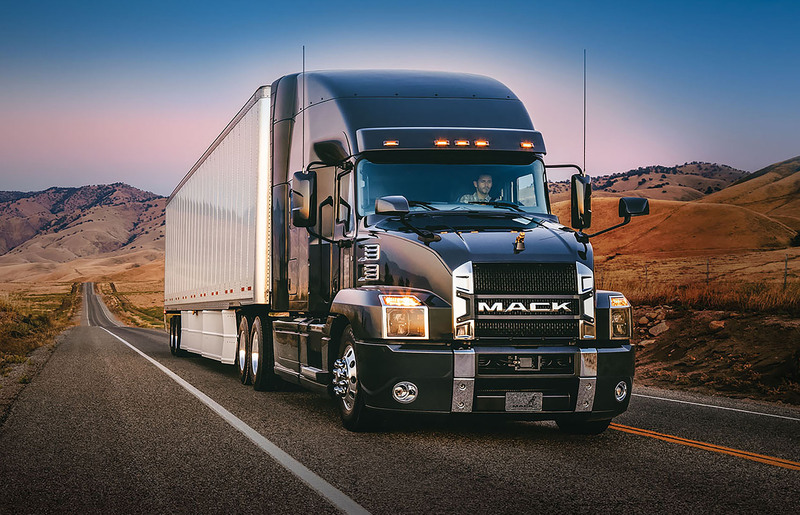 Mack Connect will serve as the reference for Mack's growing connectivity and uptime service offers. With Mack Connect, current and future services will be structured under connected support, connected business and connected driving. Using predictive analytics and connective technologies, Mack Connect turns data produced by the truck, the driver and the service process into insights and actions, resulting in superior support and service to Mack customers. Under Connected Support, Mack GuardDog® Connect, which proactively monitors truck performance on Mack models, is Mack's integrated telematics service. Should a potential issue be detected, GuardDog Connect automatically notifies Mack's 24/7 OneCall® staff at the Mack Uptime Center. OneCall agents determine the severity of the issue and provide the customer's designated contact with decision-critical information through Mack ASIST, an online communications and service management portal. Under Connected Business, GuardDog Connect can send vehicle data directly to Mack's fleet management partners. This allows customers to choose fleet management software that works for their business, without having to rely on third-party hardware installations. "Getting the most miles out of a truck is key in today's trucking industry," said David Pardue, vice president of connected vehicles and uptime services, Mack Trucks. "Mack gives customers the connected driving tools required to boost productivity and efficiency." For Connected Driving, Anthem's information and entertainment options, including Bluetooth connectivity, satellite radio and Apple CarPlay integration, allow drivers to focus on the road. Additional applications such as navigation can be downloaded. "The Mack Anthem rounds out Mack's full lineup of heavy-duty vehicles," said Roy Horton, Mack director of product strategy. "Combined with our integrated powertrain, connected vehicle and uptime services, the Mack Anthem brings the most complete package to the highway market." The Mack Anthem is available for order now, with full production beginning in Q1 2018. For more information, please visit (landing page) or your local Mack dealer.